I am very lost. My first time to have a gold dust eel. I'm not sure what's happening to it. Pls help me.. what should I do.. So our eel has white longish fungus looking stuff growing from its gills and face. It's pretty bad, but only noticed it yesterday. I feel like we would have noticed white stuff growing on it cuz we check on our tanks before and after work everyday. It's in a tank with a bunch of guppies and a small catfish and ghost shrimp which we buy for it to eat. I was trying to figure out what it could be, can eels get aquarium mouth fungus? Or ich? I recently bought a Gymnothorax tile from my local fish store. I was excited because I have always loved eels. I took him home and placed him in my cycled 50gal tank with live rock. He is the only fish as of now. I noticed last night when he came out of his cave that he had white stringy stuff around his head. This morning he's been breathing odd and leaning to his side. I checked my water and 0 ammonia, 0 nitrates, ph8, salinity is 1.020 and temp is 80°f. I found out the store kept him and his tankmates in freshwater. Did I hurt him with the salt? I'm very worried. Hope this email reaches out to you guys! I'm in need of serious help. I recently bought a moray eel and was told it's a freshwater eel. After more research, I ended up putting the eel in brackish water. 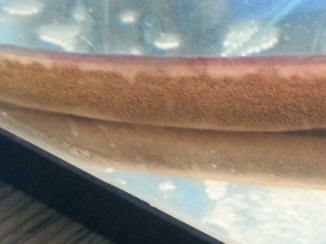 It's a 1 1/2 foot long Gymnothorax tile eel. Recently I noticed that the tail looks like it's dissolving or coming apart. Please help me. Attached is the video of her breathing rhythm as well as a few pics of her tail. Hope you can find the end of the tail that looks like it's coming apart. Thanks Bob for responding back to my email. I looked on the link you provided (thanks!) and it sounds like its nothing to worry about unless the condition on the tail grows or get bigger right? I forgot to ask in the original email. Will a 55gal tall tank be enough for one eel? Sorry, I'm not familiar with Furan cod.s? I need help I dont know whats wrong with my eel. I have him in a medicine tank with tetra lifeguard all in one treatment but does seem to be getting better. Here are some pictures of him please help. Yes I didn't know the proper name for him. Yes I do have some salt in my aquarium enough for him to be fine and not too much for my other fish. 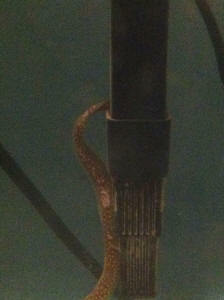 Secondly the eel in the picture is of the second one I have. I bought him with I slight fungal infection and took care of it. About a week later he started to look like the pictures. That infection is what I don't know about. Over the last week we have noticed that our eel is looking rough. He hasn't eaten in over a month (I know they do this) but a few days ago we noticed a huge bulge on him. Today he is lying on his side looking like he is dying. He is currently in a 135 gal tank, full saltwater (SG 1.024), water parameters are all within normal standards. <Use the search tool on WWM with the two words: "fish goiter" and read on! 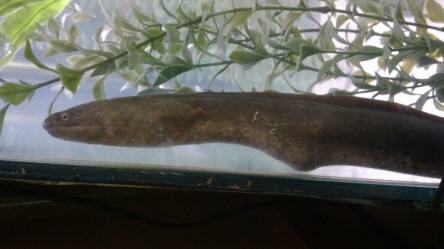 Over the last week we have noticed that our eel is looking rough. He hasn't eaten in over a month (I know they do this) but a few days ago we noticed a huge bulge on him. Today he is lying on his side looking like he is dying. He has been eating fine.... So I can't explain the weight loss. This morning he was active but nothing out of the ordinary and tonight he was lying outside of his cave in his side. Not his usual caper so I knew straight away something is up. I checked his water which is a little saltier than normal and I'll have his water tested tomorrow professionally. For now as it's 12am here I have added some fresh water and an extra filter for more oxygen and treated the tank with easy life. He is in a 164 litre tank on his own. If you can suggest anything or would have any explanation for the rapid weight loss I would greatly appreciate it. I have my fingers crossed he makes it through the night. Thank you. <An ended constipation, endoparasites (internal parasites), some tumors and laying eggs can be related to a rapid weight loss. First the water parameters should be checked (esp. pH, nitrates) to see if the environment is sufficient (relevant for tumors related to bacteria). A larger water change won't hurt. If lumps occur on the fish it can be hard to differentiate between parasites and tumors by only looking at the fish, it seems almost impossible from just a description. For internal parasites a number of meds is available (e.g. with the ingredient praziquantal), tumors (e.g. related to bacteria or cancer) are hardly treated without the proper help of a vet. Also see WWM for morays with lumps. Let's hope for the best. nice to hear from you again. Bad news, Jim didn't make it through the night. I took some photo's of him that I can send through to you if you like. Hello. About 3-4 weeks ago after much consideration I purchased a Gymnothorax tile from the fish store I work at. We kept them at about 1.010-1.013 salinity, and had them for several months before I decided to bring mine home. He is currently in a 29 gallon tank, that will be upgraded within 2 months to at least a 50 breeder. He is roughly 8". Tank was running as a freshwater tank for one year, and I converted it to brackish using marine salt. Salinity is 1.014. Ph: 7.8, Ammonia: 0, Nitrite: 0, Nitrate: 20. Temp is 78 degrees Fahrenheit, and is currently running on an Eheim ECCO and a sponge filter. I do 20-25% water changes twice a week. Considering running a Hydor circulation pump at the surface, but not sure if it will be too much water flow. Fine sandy bottom with plenty of PVC caves, thinking of adding lace rock and creating more natural caves. He has one tank mate, a Batrachomoeus trispinosus, another so-called 'freshwater' fish. These two were in the store tank together for approximately 4 months. The eel gets fed 3 times a week. I have been feeding him krill, clam strips, and lance fish so far. Thinking of adding ghost shrimp harvested from my freshwater tanks and earthworms to his diet. He seems good appetite and activity wise (active at appropriate times), but when he comes out to feed I've noticed what appears to be sand sticking to the slime coat of his belly. If I stick my hand in the tank and lightly touch him, it comes right off, but I'm curious if he could be stressed and producing extra slime coat? <I don't think so. I suppose this is due to an interaction of the specific sand with slime. I have seen this happen mostly with relatively new sand. I didn't notice this in the store, but the sand I chose is very fine and soft, and the sand we had in the store was, I believe, a denser sand marketed for African Cichlids. Otherwise, his color is an even dark grey, with some minor speckling if you look closely farther down his body. No white or faded patches. Any idea what could be causing this? Is there even reason for concern? Also, is the Batrachomoeus trispinosus compatible long term? or even short term for that matter? If yes, will he handle a full marine conversion the eel requires in the future? I bought a 30 gallon tank about 2 weeks ago and bought a freshwater eel (Gymnothorax tile) and a Pictus catfish. I know I made a major mistake by not cycling the tank first (I added a Quickstart thinking this would work). AFTER I bought everything and reading on the internet I realized the eel should really be in brackish water and also my tank was too small for the 18 inch eel and 5 inch catfish. He was kept in freshwater at the pet store and they told me to put him in freshwater and I made the mistake in believing they knew what they were talking about. 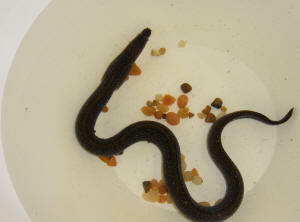 The water had high ammonia (between 1 and 3) within days and the eel stopped eating. He was eating frozen shrimp great and then one night it looked like he threw up his shrimp and after that slowly stopped eating. I went 3 days ago and bought a 100 gallon hoping that would help the water. We added the new and old filter together to help set up the bacteria and added better beneficial bacteria. We are now using a cascade 1500 canister filter. He has been in the water for 3 days now. He still has no interest in food. Now since we moved him he is also laying upside down with his mouth open and looks dead. Then if the catfish bumps him or we give a tap on the tank he jolts upright and does very open mouth big gulps of breath (he has been doing the big gulps of breath for about a week now). The water test today says ammonia 0 (I think it's 0, yellow with a tinge of brown not green on the test strip). Nitrate between 0 and 20, nitrite 0, hardness .25, alkalinity we think is over 300 (it looks blue), and ph 8.2. Water temp is 80. We have been adding a TBSP per 5 gallons of salt but just read it should have been marine salt. Long term, I don't really want to set up this 100 gallon as a brackish but would he be ok in a brackish 30? Or would he be ok if I tried to set the 100 up as full salt water and move the catfish? A second local fish store that is the most knowledgeable said he would also be ok in fresh since he was used to it. My question is what is going on with his breathing and being upside down and where do I go from here to keep him alive short term and long term. Thank you so much for any advice you can give me. but I have added about 1 cup less than a half of a box (I was told that I should do half the recommended dose) that was specifically measured for a 10 gallon tank, which is what he is still currently in. I have upgraded his filtration system to 2 filters made for 10-30 gallons, and added a heater. Right now his tank is about 28 degrees Celsius. He is currently on a steady diet of shrimp, they were feeding him cubed ham which after doing research I found was a big no-no, I will be introducing silversides into his diet tomorrow. Ok with all that being said, my Gymnothorax tile has been acting very strange lately. He seems to be struggling to breathe on and off throughout the day, flipping upside down and laying there for a few seconds, and then violently thrashing his tail back and forth creating craters in his sandy bottom. I am new to owning this species, and have done all the research that I can, but I just can't figure out if his behavior is normal. Will he/she be ok, and is there something that I am doing wrong? Please help. Hi again, this is Alyson (the one with the "piggy" Gymnothorax tile) Since we last spoke I have been feeding him lesser and lesser each day to get him used to eating every other day. He is doing fine, keeps "begging" but I just don't look at him lol. I did have just two more additional questions....I was planning on purchasing another Gymnothorax tile and I have read on your site that they can live together and normally don't show any type of aggression towards one another. I was just wondering if I do actually purchase an additional eel should I look for any "hints" that two are being aggressive towards one another <There may be an initial 'fight' at first contact, since one has established its territory, but if there are enough caves it should be no problem. Hi again Marco, it's once again Alyson. but I can not find vitamin supplements anywhere for my eel's food. There are 6 pet stores and no one has them and don't even know what I'm talking about (Haha I know right), so my question to you is there a brand/site that you can recommend so that I can order it over the internet for my eel? Also, the only pet store in my city that has live rock is a very "dirty, sick animal type place" so if you can also recommend a good, trustworthy site to order live rock from? If so, that would be awesome. I know in previous emails you have advised me to get a skimmer, trust me I am definitely saving up for one lol. I still only have the one Gymnothorax tile, but I ordered another one and it should be in Tuesday so wish me luck. Once again, thank you so much for all of your advice and help, although my eel is still laying his head sideways I am going to take your advice and not worry about. Hey again, hopefully this should be my last question for awhile ( I know you're probably thinking thank goodness lol). Since I cannot locally get the vitamin supplements for my eel's food, I was looking at your site and saw some things about being able to add baby and/or human vitamins to fish food. I spent all of today searching the site to see exactly (if so) what types of things to look for if I choose to go that route. I definitely need to add vitamins to Eely's food because although it's a variety, it is mostly frozen. If it is ok and safe to add baby and/or human vitamins, what should I look for and avoid when purchasing? Also, how do I go about adding it to an individual feeding? And by the way, my new Gymnothorax tile should be in tomorrow (yay). Anything you know on supplementing human vitamins for "fish" vitamins would be awesome, if not I will have to order some online. Thanks again. (still waiting for the pet store to call to say it came in) Yesterday I bought some more "caves" and what not and rearranged the tank decor so I am hoping that will help with the "new arrival" Thanks again for all of your help! Sigh....I thought for sure the last email I sent you would be the last lol. 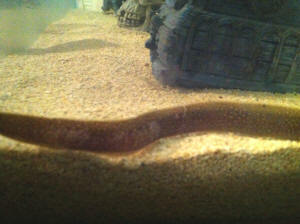 In previous emails I mentioned that my eel was laying his head sideways out of his cave. Well today he was very active, swimming around, exploring the new tank decor. That is when I noticed between his right eye and nostril, also his lower jaw, was very pale. The patches were not white nor did they look like a "fungus" of any kind. The patches are not on the other side of his face, but the reason that I am concerned is that when he did finally go back into his cave, he was rubbing against it on that same side. I was searching your site and saw something about "white spot disease," but the pictures I saw didn't look like what is happening in my case. To be safe, should I treat for Ich?? Other than his "scratching" he seems perfectly fine, happy with his new decor and such on, but once again any advice would be helpful. Thanks again! <Check your water, ensure there is enough oxygen in the tank. Good luck. 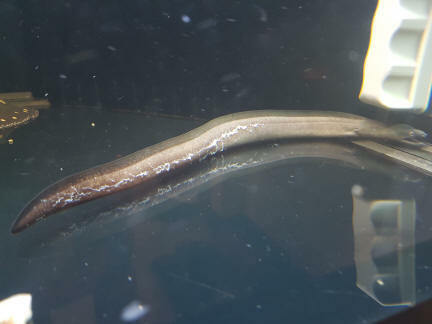 Hi again Marco, I guess I had forgotten to mention that before placing the "sick eel" in my community tank, I did put it in a quarantine tank 1.To get it used to some salinity and 2. To watch how it was....It seemed relatively fine in the quarantine tank. In regards to the "swollen throat" I either jumped to conclusions thinking it was bacterial or was right. It was also very skinny (I know it had probably not eaten in a while since he was in captivity maybe making his throat seem slightly bigger?). After watching him in the quarantine tank (not showing any signs of sickness) that’s when I decided to move him to the community tank. wwm: Quarantine is rather a matter of weeks instead of days (or hours). At first he was swimming around exploring for about 5-6 min and then he just nose dived into the sand and laid side ways. He appeared to have stopped breathing, that’s when my eel went up and nudged him. So, I immediately removed him and put him into the hospital tank and treated him with (you're right I misspelled) Maracyn. I believe it was just too late. He started getting paler and paler and eventually died. Maybe it was bacterial or maybe it was that in combination with stress and starvation I don't know and I'm sure him being kept in freshwater for a long time at the LFS didn't help either. But in response to "putting a sick eel into my tank" I believe I took every precaution before adding him. I quarantined him first and he didn’t not show any signs of "sickness". wwm: You had the suspicion and I think you were right for quarantining the eel. Won't argue here, though, since this case is closed, all that can be stated is: If you think a fish might be sick don't buy it and if you still do buy it quarantine for some weeks it until you are sure it is healthy. I was a veterinary technician for many years (we didn’t deal with fish though lol) so I take great care of all of my animals. My eels are like my children and I would never do anything to intentionally hurt them. They are in my home office, so I watch them all day, constantly checking PH, ammonia etc. I just want to make sure I am doing everything I possibly can to ensure they are healthy and have a healthy environment (I guess that’s why I bother you so much with my concerns). As far as my baby eel goes, he has learned not to go into a cave that Eely is in lol and I actually got him to eat 2hrs after purchasing him. Another question is since he is a baby should I keep the water brackish until he grows and then turn to full marine? wwm: Can perfectly live in marine water even at small sizes. I read that the juveniles live in brackish and as adults they migrate to full marine so if I could get your advice on that. wwm: A theory that to my knowledge never was substantiated by usable evidence. I am still saving for a skimmer (boy, they aren't cheap), but not knowing much about skimmers, can you use them in brackish or just strictly full salt? wwm: Most start working quite well at brackish salinities, but at higher salinity the surface tension of the water will be higher, so it become easier for stable bubbles and foam to form and more organic material will be removed. I dont know if you remember when I said I ordered a new Gymnothorax tile to add to my tank. Well, it took until yesterday to show up. My local pet store had three, one that was the same size as my G. tile and two babies....Well as I was looking at the "bigger one" I wasnt happy about his throat. 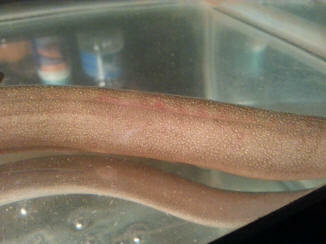 It seemed swollen (which led me to believe maybe bacterial infection) and he was not hiding like most eels do. Well, against my doubts I purchased the larger one so that there wouldn't be a "size to size" issue. wwm: The best option would have been to purchase none of them, but the sick fish is mostly the worst choice. wwm: Don't know this one. You probably mean Maracyn. wwm: Like, why did you buy a sick eel and put it in the display tank possibly introducing pathogens instead of the hospital until it heals or dies. I purchase one of the baby G. tile. Yes I am aware at the bullying that could happen between my larger one and the new one. So far so good. There was an initial fight when the baby tried to go in "Eely's" home and I broke it up. There was no signs of damage to the new eel and in response to that, the baby later on, went up and nipped the bigger eel's tail lol (once again no injuries). wwm: Doesn't sound too bad so far. Keep an eye on them. My problem is that after removing the "original new eel who died" my nitrates skyrocketed. I did a 50% water change, but still no change. PH is at 8.0 and ammonia is at 0...Any ideas??? wwm: I don't think this is directly connected to the new eel. The short term solution for high nitrates is water changes, the long term solution is to improve filtration. When you reach marine salinity, a skimmer would likely be a good investion. Until then I think water changes are your best option. Also read here http://www.wetwebmedia.com/nitratesmar.htm and in the linked FAQs. Thanks again Marco, I will monitor these "spots" on the baby eel and if anything changes in regards to that I will definitely contact you (with pics). Hey Marco, I was finally able to pics.....they're not the best in the world, but I tried. It seems to have spread. I know they are a little dark, but it was the best I can do. If you can tell what these patches may be, please let me know as soon as you can. He is still acting normal, but now since it seems to be spreading, I am thinking it is more likely a disease. Please let me know your thoughts on this. I have looked on the WetWebMedia site looking at diseases (especially on eels), but I can't pinpoint what this is according to the pic on your site. I will be waiting for any advice you may have. Thanks again. Thanks for getting back to me Marco. I know those weren't the best pictures in the world, but I don't know if you could tell by them, that the spots didn't look granular like Ich, nor was is filmy like a fungus. The spots are just the same color the eel's belly is. So I'm with you thinking the spots maybe scar tissue. Got a couple more questions though, the same eel (the baby) loves to hang on the filter and on the tops of the plants that I have in there. He acts normal and usually does that after my big eel chases him. He just hangs there and watches curiously as opposed to watching from a cave. I'm assuming he does that to be on the safe side so he doesn't run into the big eel. Would that make sense? but I will wait to hear if this would be a good supplement to use or not. Long time no email Marco lol. Last we spoke I had sent you some pictures of the patches on my new little eel. I am just writing you to tell you that I am almost 100% positive they are healing scratches. Although it is "spreading" the eels get into a minor quarrel at least once a day. The reason I am quite sure it is healing scratches/scar tissue is because one time when they got into a scuffle my big eel nipped at the top of the little one's head and the next day he had a spot on the top of his head. I know you said in earlier emails that if they are healing scratches that I do not need to treat it, I just want to make sure that I don't need to get some kind of substance with aloe in it to maybe help?? I don't know lol. Even though my big eel is a bully, this little guy is feisty and will sometimes go right up to my big eel and nip him in the face and swim off. It's actually quite humorous because my big eel will not even retaliate. I want to thank you again for your input on the pics I sent you previously, and like always what you suggested "does almost look like healing scratches from bite marks" was absolutely right. As for my earlier nitrate problem, I'm thinking my tank maybe "established" now??? Because I have had 0 nitrates and 0 ammonia for a good almost 3 weeks now so unless something major happens in my tank, you probably won't be hearing from me. and if you get paid for working for that site, then you need to get a raise lol. Hey Marco, in previous emails I had mentioned about my nitrate rise (thinking it may had been caused by the sick eel) and you reassured me that was not the cause. I just want to let you know that you were right. After another water change, with ammonia at 0, my nitrates were still through the roof so I went to my LFS and talked to the girl (who actually knows what she is talking about) and explained my situation. She asked if I use city water (which I do) and if I had done/added water to the tank after a heavy rain (which I did). She said that especially after a heavy rain fall, our crummy city water is loaded with nitrates and that the water conditioner only removes chlorine from the tap water and nothing else. She referred me to a product called Prime made by Seachem and said to remove nitrates, add three times the amount that you would if you were establishing a new tank. Well it worked. Nitrates are at 0 and now I know about my city's water. Have you ever heard of that type of situation? The new baby eel that I had purchased after the "sick eel" is absolutely doing great! He is eating and is a feisty little guy. My big eel used to pick on him and I would have to break the up a few times, but now I believe that my big eel knows that the little guy isn't going down without a fight. I do have a question though, near the little eel's tail, there are two small white patches the same look and color that his belly is. Please do excuse me, I am trying to get a camera that can take a good picture. It is not Ich, and does not resemble a fungal infection. He is not scratching on anything and is acting completely normal. I was just wondering if they may go through different color patterns/colorations during the growth cycle? going to explode. Please help. I purchased a fresh water snowflake eel at a pet store about a month ago. 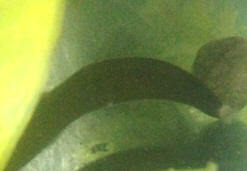 The eel was in a fresh water tank with other cichlids of which he is with now. I have a 55 gal fish tank and the water levels are good. There are plenty of hiding spaces, surface tension, filtration and O2. I haven't had much luck with feeding from what I have observed; I have been feeding frozen shrimp and have fed feeder guppies. It is hard to get ghost shrimp where I live. <You don't need live food. Feeder Guppies -- unless you're breeding your own at home -- aren't a safe food, so stop using those. You cannot use live fish bought in a pet store as food. It's unsafe, and a good way to make your fish sick. In the right environment these morays are quite greedy. I recently noticed the snowflake eel violently shaking while swimming and kind of just hanging in some of the plants with his face in the rocks; his body also appears to be more white and splotchy than when I first got him. He has also developed red spots along his body. is Marine rather than brackish but I don't think this could cause a tumor to form. The tumor is the same color as the eels mouth lining and has filled in the upper palate in the eels mouth, it is also beginning to show on the eels upper "lips" as black/pink lumps. The only reason I can personally think of is it's very unusual diet, the only food my eel has ever been willing to eat is raw salmon fillet of all things, (I do dunk the salmon in supplements though for nutrition). I've had the eel for approximately two years now and the tumor has been visible for a few months now, and in that period the eel has been exposed to a few different anti-bacterial medications with no apparent effect. The eels appetite hasn't been affected yet but if the tumor gets much larger it may threaten to block off the eels mouth entirely. Any information you may have on this situation would be greatly appreciated. Thanks for your help guys!